President Obama advertised some big endorsements for his tax-the-rich more policies and class warfare reelection strategy yesterday. I’ve already dispensed with their distortion that the rich are overtaxed. Today I would like to discuss one of their other favorite fallacies – that Obama is engaging in “class warfare” (I’ll ignore their disparagement of Obama’s religious convictions). So, what evidence is there to support the claim that Obama is engaging in class warfare? As far as I can tell it all stems from Obama’s position on taxes. Firstly, he wants the Bush tax cuts to expire for income above $250k. Secondly, he proposed a “Buffett Rule” to ensure that millionaires pay a higher tax rate than the middle class. From two days ago – Whitehouse Introduces “Buffett Rule” Legislation. Washington, DC – Last week, in his State of the Union address, President Obama said: “Tax reform should follow the Buffett Rule.” Today, U.S. Senator Sheldon Whitehouse (D-RI) introduced legislation to … ensure that multi-million-dollar earners pay at least a 30 percent effective tax rate, just as President Obama proposed. 1. People making between $250,000 and $1,000,000 (the top 4%) would pay the same effective rate they did in 2000. 2. People making over $2,000,000 (the top 0.1%) would pay a minimum 30% rate. This second change would significantly affect only people like Warren Buffett and Mitt Romney – multi-millionaires who are making the bulk of their income from capital gains and dividends. Even so, these very wealthy Americans would only pay 2% more than they did under Ronald Reagan’s Tax Reform Act of 1986. 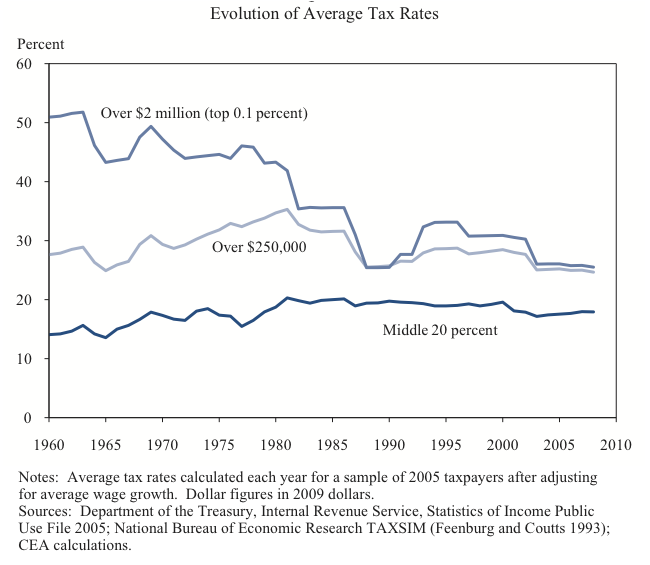 Still, both groups of taxpayers would be paying tax rates at or below their 50 year average. Class warfare indeed! As usual, one side of the argument has to distort the truth to make a point. Conservatives do not believe that the “rich are overtaxed.” Conservatives believe that increasing the tax rate will not improve the economy, the deficit, or the debt, nor increase the tax base. The simple truth is, you can take EVERYTHING from the “1%” and you still won’t be able to cover this years deficit, nevermind the debt. Anyone with a keen eye for detail will notice that no article or commentary advocating for higher taxes EVER explains how this would in any way improve the economic condition of the nation. There has never been a time when increasing tax rates has spurred economic growth. However, there is plenty of evidence, not to mention common sense, that lowering rates will improve the economy and expand the tax base. The simple economic fact is that more people paying at a lower rate yields more revenue than fewer people paying at a higher rate. This is even more true since many of those who do not pay taxes are an extra burden on those who do, since they take out far more than they put in. The point of this article was to make the case that Obama is not engaged in “class warfare.” I don’t know what your definition is, but most people would agree that “class warfare” is attempting to pit one group of people against another group of people based on income. Are you honestly trying to argue that Obama has not been doing exactly that? How many times does Obama mention this “class” or that “class” in his speeches? To argue that Obama isn’t hoping to win the election by playing on the envy of a one group of citizens against another group of citizens is absurd. I would argue that the whole notion of “classes” is inherently un-American. There is no “class” system in America, and many people move up and down the economic ladder (“classes” if you insist) during their lifetimes. Did millions of immigrants risk their lives to leave their home countries (with real “class” systems etched in stone) to come to another entrenched “class” system with no hope for advancement? Of course not. Finally, a progressive tax system is, at its core, Marxist/Socialist/Communist. A progressive income tax system was the second plank in the Communist Manifesto (the “second amendment” of the left perhaps?) and “Class warfare” is the core of Marxism/Socialism/Communism, which sought the rise of the “proletariat” through “class struggle.” So if the “Buffett rule” is inherently Marxist, how could Obama NOT be fully engaged in class warfare? I never said “conservatives” believe the rich are overtaxed. It’s John Hinderaker over at Power Line that repeatedly says this. That’s what I was responding to. I also never claimed you can balance the budget on tax hikes alone. But according to the CBO, tax cuts since 2000 have added $2.8 trillion to the national debt. Those tax cuts were paid for with borrowed money. I think those that benefited from them should pay that money back – not Social Security recipients. The CBO also disputes your claim that lowering taxes increases revenues. Class warfare is the topic of my next post. When you look at the data it’s obvious – if there is such a thing as a class war – the middle class is losing. Even if Obama gets every tax increase he’s asking for, they will still be losing. It’s not even close. I agree with you that classes are un-American. Socio-economic mobility is the real American dream – regardless of what realtors want you to believe. Today, socio-economic mobility in the US is at lows not seen in 100+ years. Of the advanced countries, only the UK and Italy are worse. Finally, I don’t know where you got the idea that a progressive tax system is Marxist. If so, we must have been much more Marxist in the 50’s, 60’s and 70’s when the top tax rate was over 70%. So tax cuts adding 2.8 trillion to the debt in 13 years is outrageous, but Obama adding nearly 5 trillion to the debt in three years is fine? This money isn’t any less “borrowed” than Bush’s. Is your problem with tax rates or debt? Either way, the primary issue is that spending is out of control. Overall Federal revenue in 2007, at the height of the much maligned Bush tax cuts, was the highest ever in the history of the United States, a fact our Democratic politicians will never admit. With the exception of a Republican forced balanced budget during the Clinton years, the problem has always been that spending far outpaced revenue. This is a political problem, not a function of tax rates. With regard to the the Clinton tax hikes somehow leading to economic growth, I would argue you confusing correlation with causation. There were many issues at play in the the 90’s, including typical post recession growth, the end of the Cold War, inflation being non-existant, and the tech boom. Remember, this was the only time in history someone could become a multi-millionaire using a sock puppet to sell dog food. Additionally, revenue increased at its greatest rate (and to it’s high water mark) AFTER Clinton’s tax cut (or more accurately, the Republican Congress’ tax cut), which I believe proves my point. The low tax rates of the 1920’s did cause an economic boom, but certainly did not lead to the Great Depression, which I hope is not what you are implying. Increased taxes on imported goods (the Smoot-Hawley Tariff Act), the Fed tinkering with monetary supply, the stock market crash, and bank failures are agreed upon causes of the Great Depression, none of which have anything to do with personal or corporate tax rates. I’m glad we agree that the “class” system is un-American, no one can say we can’t agree on something! However, you fail to mention what should be done about it. With regard to the “middle class” “losing,” I would argue that there will always be inherent inequality in result, since there will always be inherent inequality in work ethic, education, upbringing, inheritance, skill, desire and luck. The only way to possibly change all of that is through tyranny and governmental crushing of the human spirit. The Soviet Union, China, North Korea and Cuba are all examples of what happens when you attempt to do just that. If you were King for a day, what would you possibly do to increase “socio-economic mobility,” or to monetarily equalize the “classes” that wouldn’t be completely in opposition of our history and Constitution? The fact that there are bazillionaires and homeless in the United States is a function of inequality of outcome, not inequality of opportunity. I’m sure we can both agree that ensuring equality of opportunity is one of the central missions of American government. I can’t speak for you, but I think the Government attempting to ensure equality of outcome is a disaster. It should be no surprise that socio-economic mobility is currently low, since our economy is in freefall, no matter how much the Obama administration tries to fudge the numbers, and it is ironic that our socio-economic mobility score is near Italy, when we are approaching their debt level. Seriously, progressive taxation is one of the ten planks of the Communist Manifesto, look it up. And yes, I suppose I would agree that we were “more Marxist” in the 70’s. Would you really advocate going back to the tax, energy and defense policies of the 70’s, which were such an obvious disaster? So to sum up, you appear to advocate for higher tax rates, but have yet to offer any evidence that this will solve any of our problems (socio-economic mobility in particular), or provided any real evidence that higher tax rates spurred economic growth in the past. You seem to claim that tax related increases in debt are bad, but don’t appear to be concerned about spending related increases in the debt, which would be ideologically inconsistent. Anyway, I still appreciate and enjoy the debate….. I appreciate your comments and also enjoy civil political and economic debate – especially when someone intelligently disagrees with me. It forces me to defend or rethink my position. My goal is to become more correct, not prove that I already am! As far as Obama’s deficits are concerned, I think you can only blame him for his spending increases. Most of the recent deficits are due to declining revenues which resulted from the recession that started over a year before he took office. I think this graph shows this pretty clearly. With the exception of the stimulus, Obama’s rate of spending increases have been roughly the same as Bush’s – averaging a little over 6%/yr. I think everyone is now in agreement that this rate of spending is unsustainable and needs to be reduced. I have little doubt spending cuts are in our future. 1. Tax changes don’t effect real GDP growth that much. The tax cuts of 1986, 1997 and 2001 didn’t really boost real GDP growth as much as most people believe. The tax increase of 1992 didn’t have any appreciable effect either. 2. Revenue as a percent of GDP has been noticeably lower since the 2001 tax cuts. The recession of 2001 saw revenues decline much more than other recessions, even though it was relatively mild. I disagree with you, however about the 1920’s. I am a big believer in balance and sustainability. Whenever the economy stays overheated for too long, it’s followed by a period of weak growth or contraction. No doubt that Smoot-Hawley made the depression worse (especially since we were an exporter). But no matter what the government did or didn’t do, the economy needed a recession to fix the excesses of the 20’s. For a current example, we built millions more homes than we needed during the housing bubble. We are now going through an extended period of below normal residential construction. At some point, we will absorb that excess inventory and resume homebuilding – which is what usually leads us out of recession. Regarding income inequality and social mobility, my next post will have more to say on those subjects. What I’ll mention now is that I agree with you that some people will always make more than others. I’m not arguing for absolute equality – just less inequality. The kind that existed in the 50’s and 60’s for example, when a man with a modest job could raise his family on a single income. Finally, yes, I am advocating higher taxes. But I also want to see lower spending – even on entitlements. I think getting back to a balanced budget requires both. Great exchange, I hope this blog brings in more comments like yours! To a “conservative” (and I count myself as one) Bush’s rate of spending wasn’t palatable either. Nor was the unfunded prescription drug entitlement. There are arguments to be made that Bush was not a fiscally conservative President, tax cuts or not. “Good economic growth may come on the heels of tax hikes,” but you still fail to descibe how tax hikes now, in what is still a horrible recession, will somehow get us out of it. C’mon, quit dancing around it, how do you think it would help! We both seem to agree that increased revenue and decreased spending are the key to debt reduction, but I still believe economic growth, not increased tax rates, is the path toward increased revenue. There is only one time in American history when economic growth coincided with increased tax rates, and we both seem to agree it was a coincidence. Nobody wants more inequality, not even evil conservatives like myself. I assume the source of our disagreement would be how to decrease it. I don’t want to speak for you, but it appears to me that you would argue for more Government intervention in the economy. Personally, I think that would be disastrous. I would argue that our current recession was primarily the result of Government intervention in the housing market by underwriting mortgages and removing risk. Throw in Governmental arm twisting in the form of Community Reinvestment Act, and turning a Congressional blind eye to outright fraud on the part of Franklin Raines at Fannie Mae, and it seems that catastrophe was unavoidable. No free market capitalist system can function without risk and reward, and our Government is going way too far in attempting to reduce the former and increase the latter (particularly for campaign contributors). I’ll be interested to see your next post. I’m sure we have some different views on why it may be so much harder now for a normal “working class” person to succeed…. I agree that reasonable discourse is missing on the net, and I hope your blog will offer lively debate. However, I’m sure the trolls aren’t far away. If I could only invent an IQ based Captcha system, I’d be a millionaire….. I never said that tax hikes will get us out of the recession. I said the kind of tax changes we’ve seen since the 80’s have had no noticeable effect on GDP growth. The second graph from my last comment proves this point. What’s going to get the economy back to normal again is housing. If you look at modern recessions, they almost always end with a pickup in residential investment. Here are two more graphs! 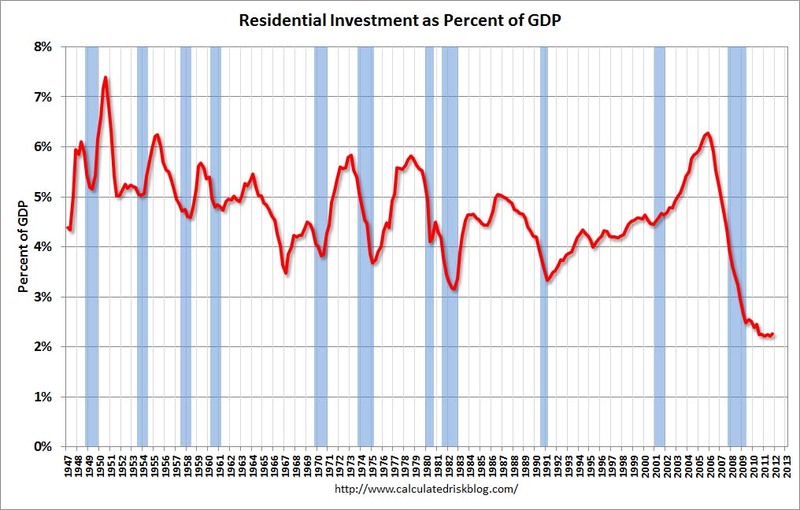 The first one shows Residential Investment as a percent of GDP. You can see that in almost every case, RI picks up at or near the end of the recession. This current recession is the only exception. RI hasn’t picked up yet, because we still have too many homes. 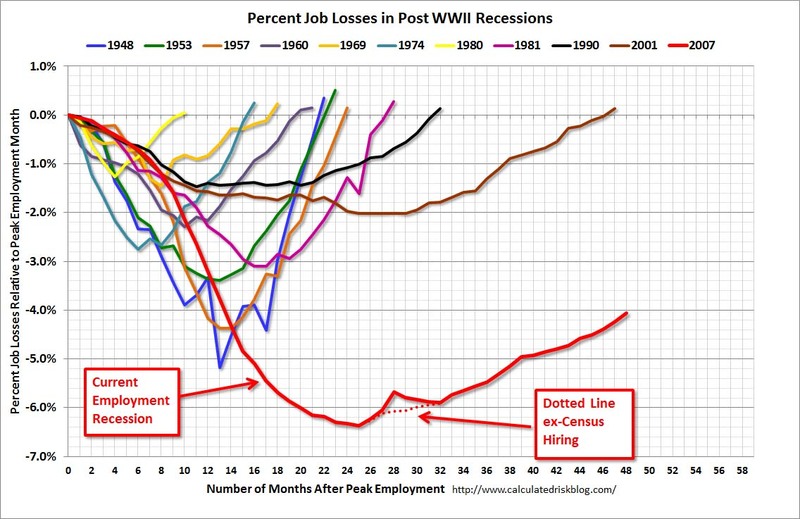 The next graph shows job losses during recessions. This latest recession has had the biggest job losses of any post-WWII recession and is taking the longest to recover those lost jobs. There is a very high correlation between the recovery in RI and the recovery in jobs. But the good news is that the foremost authority on all things housing related has just declared The Housing Bottom Is Here! Actually, I don’t want more government intervention in the economy. In fact, I would really like to see an effort to weed out inefficient and unnecessary regulations. I would also love to see a simplified tax code. As far as reducing inequality, I think the solution is… unions. Now before you tear me to pieces, hear me out! I don’t endorse any union that makes unreasonable demands, makes it hard to fire bad workers, or doesn’t make the companies success priority #1. I think the only legitimate function of a union is to represent workers during negotiations with management. What’s happened since the 70’s is that unions have all but disappeared in the private sector. At the same time, private sector wages have gone nowhere. And workers have had no representation in Washington, how else can you explain the fact we let China unilaterally set the value of it’s currency low to ensure a competitive advantage over US workers? I think a healthy capitalist economy needs checks and balances between labor and management. The situation we have now where executives have all the power isn’t working.